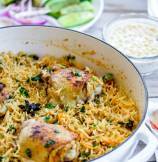 Mild Indian Spiced Curry Chicken cooked in one pot with flavorful Basmati Rice! Friends, this one pot dinner comes with promise of a comforting and easy weekday meal and NO huge pile of dishes to wash! Sounds perfect?! Isn't it? Curry Chicken being special favorite of everyone in my family..... Often, this one pot is my favorite to serve over weekdays! Where everyone loves the kitchen filled with Curry Chicken aroma, my secret favorite is: far less dishes to clean..... Start to end, you need ONE pot! Plus flavor!? 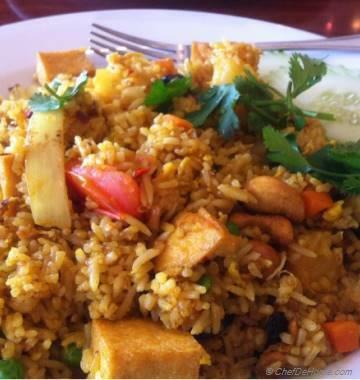 Like eating, Chicken Curry and Rice in your favorite Indian restaurant! All component of Curry Chicken Pot help boost each other's flavor! 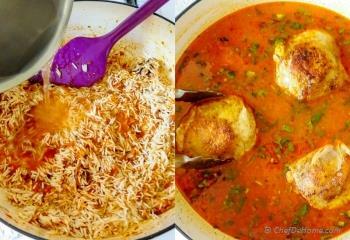 Since chicken cooks in same pot and in same spices, rice absorbs a LOT of flavor from chicken and masala. Amazingly, I almost never have to use chicken stock for such one pot rice since chicken itself releases a lot of juices and flavor in the pot. For similar reason, I never have to pre-marinate chicken for one pot or casserole recipes. All I do is: coat chicken in lemon and salt, then sprinkle with spices, mix and leave aside while I prepare rest of ingredients. 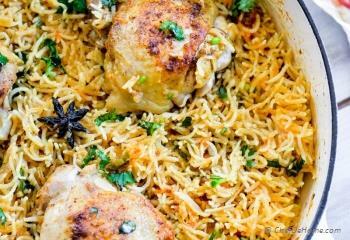 A flavor-explosion happens when that spice coated chicken is seared in pan, before going for a flavor-bath with ginger-garlic masala basmati rice! In my home, we don't address this dish as "curry" at all! We call it, "Chicken Chawal (Rice)". 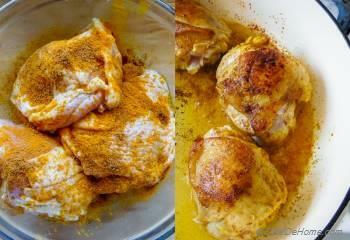 For blog, I was really wondering if I should call this, Curry Chicken and Chicken Curry? Really, just by shuffling these two words, dish gets entirely new meaning. I did not want to confuse any one thinking, this is: "Chicken Curry that is chicken with curry gravy served over rice". You know what?! At the end, no matter how we shuffle these words....... result is a flavorful Indian Chicken Dinner, all prepared in one pot. I would rate this curry mild spicy yet with very distinct flavor of Indian Masalas(spices). If same curry was prepared without rice, it may be little strong for some people. But, rice act as neutral flavor-absorbent base and hence overall taste is: a mild, delicious, savor-every-bite kinda curry. Serve some yogurt on side and you don't need anything else for dinner! Diet Info: This Curry Chicken dinner is Gluten Free and also dairy free. Also, this one pot dinner is great to make ahead for up-to 2 days. Just re-heat and enjoy! Schools are opening shortly, you can also pack leftovers, for lunch, for your kiddos with yogurt on side! How good does that sound? 1. In a bowl, add lemon juice and 1/2 tsp salt. Add chicken, coat in lemon, sprinkle 1/2 tsp of curry powder and 1/4 tsp garam masala and set aside while we prep rest of ingredients. 2. 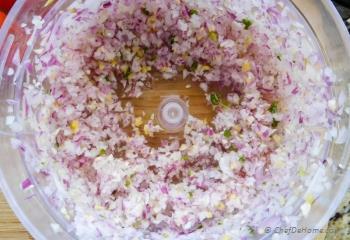 In a food processor, add onion, garlic, ginger (if not using paste) and process or grate to coarse texture mix. Set aside. Also, wash rice under running water, soak in fresh clean water and set aside. 3. Heat oil in heavy bottom pan, add chicken seasoned skin side down. Reserve lemon juice of bowl. Sear chicken on high heat for 3 minutes each side or until skin is crisp caramelized. Drain on paper towel and set aside. 4. In the same hot oil, add onion mixture and saute until onions are soft and started to change color (amber), just caramelize at the edges. (about 4 minutes) Don't let them too brown. 6. Add in rice (drain soaking water) and fresh 3 cups of water with half of chopped cilantro (3 tbsp), and mix well. Return chicken on top of rice, and bring to boil. Cover with tight lid, and cook for 12 minutes on medium heat. To ensure perfect seasoned one-pot rice every time, taste the water before adding chicken and adjust salt per liking, stir well, then add chicken. I end up with about 1.5 tsp salt for full seasoned flavor. 7. After 12 minutes, switch-off heat and leave pot covered for 5 minutes. Now, remove chicken, fold in remaining cilantro, return chicken to pan and cover to keep warm until ready to serve! Whole mace blade has very strong bite. 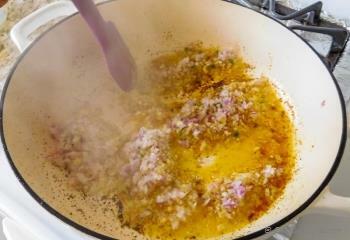 If it is still intact after cooking rice, then fish-out and discard it along with star anise. Delicious...even my cumin, coriander, curry disliking partner enjoyed it. Should have checked for salt in broth; slightly underseasoned but added Filipino patis (fish sauce) for a bit of final punch. Very good! 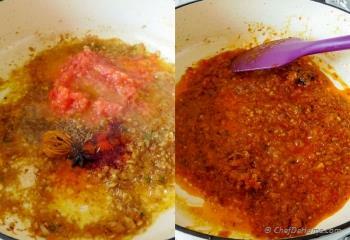 I didnt have fresh tomatoes so I simply replaced with a knob of tomato paste. Not enough curry powder so I increased the garam masala powder. Very quick and easy. Hi. Did you use basmati rice? I have basmati rice but they are not long and skinny like that. is that a special kind? Basmati rice have different varieties. They can be short grain or long grain. The kind I used are thin, long, very fragrant and usually available in Indian stores. These are also available in regular store - Asian food aisle. 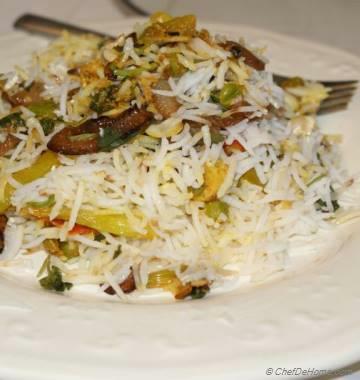 Short grain basmati are equally good but these take little long to cook and are bit more starchy. Please adjust amount of liquid and cooking time as per instructions on package. I hope it helps. Let me know if you have more questions. Hi Himanshu, thanks! I'm glad to hear your family enjoyed this recipe. Also, thanks for sharing your experience. Very good. It's an awful lot of rice for three people though. That's more rice than I'd make for four! The rice was a little mushy, but maybe I need to clean it a little more. I added some sultanas because I love the little nuggets of sweetness, and also a little cinnamon. I will definitely do this again, although maybe I'll bake it next time, but...10 mins prep and 25 cooking? Cooks/recipe writers are incredibly optimistic about how long things take to do! Soooo good! Just made this tonight and loved it, thank you! Shauna, thanks! I'm glad you enjoyed! Thanks, Devi! 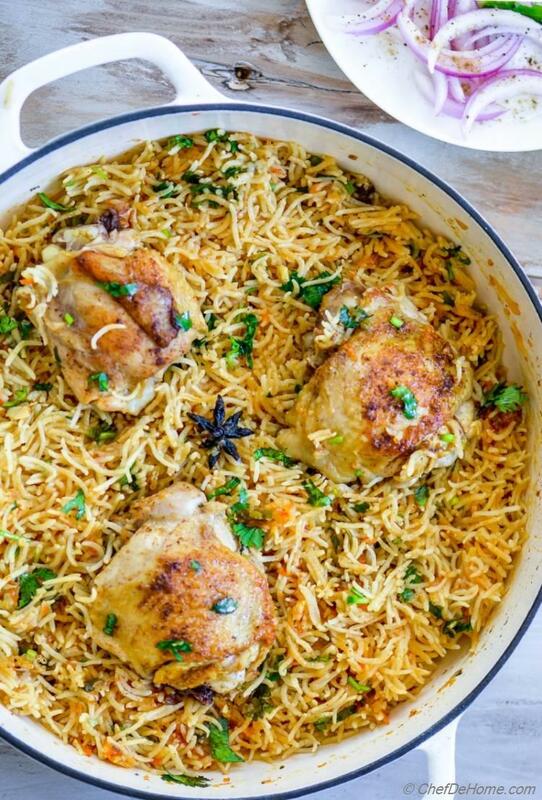 Trust me, this is one of the best and easiest way to cook chicken and rice in one pot. I hope you get chance to try it soon. Looks delicious! Being a guy I was looking for simple rice-chicken dish online and i found yours. Quick question: curry powder - what';s that? and what is an alternative to this? Can I just include haldi powder? Hi Ahmed, Curry powder is a combination of turmeric (haldi) and few other spices. 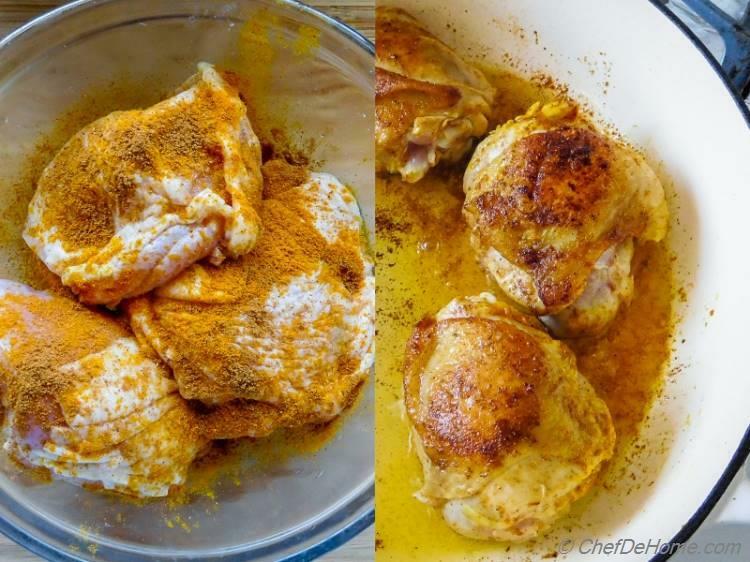 If you not using curry powder, just add equal parts haldi, jeera powder, and little more garam masala. For 1 teaspoon Curry Powder = 1/2 tsp Haldi, 1/4 tsp garam masala, 1/4 tsp jeera powder. I hope it helps. Happy cooking! Just made this for dinner tdy. Was such a hit with my family.I added a little fried onions on top fr crunch. I used skinless thighs. Next time I am going to try with a few spoons of coconut cream . Anu, sounds like your family enjoyed chicken and rice a lot. I'm happy you you tried it. Thanks, Gauri! It is one of my husband's favorite too! I'm glad you like my spiced version, however it is not hot spicy at all! One pot meals are my favorite! Love this curry chicken and rice! It looks so flavorful and delicious! Kelly, thanks! Curry chicken really came out very flavorful. I love one pot meals. Yummy meals that are easy to cleanup. What's not to love about that?! Thanks for the recipe. Thanks, Maggie! One pot meals are indeed life savers! I can't wait to try this recipe! I love one pot meals. One question, it is not easy to find Mace in it's natural blade form. Can one use ground Mace and if so, how much would you recommend? Jackie, thanks. I'm glad you like Curry Chicken. Mace is a potent spice. If you using ground mace, I recommend no more than 1/8 tsp. The blade I used in recipe stays whole by the time rice cook, so I often discard it. I hope you enjoy it when you try. This looks incredible dear. I love the bunch of flavours that work up an awesome dish all in the same pot. Two of my favourite aromatics mace and star anise you have used. Truly scrumptious. Thanks, Piyali! 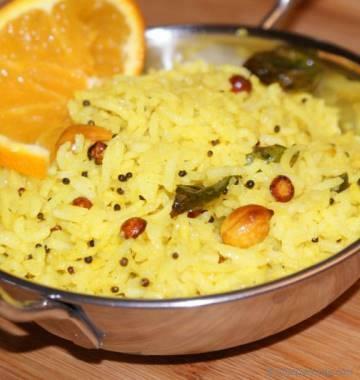 I'm crazy fan of mace, gives such a deliciousness to any curry! 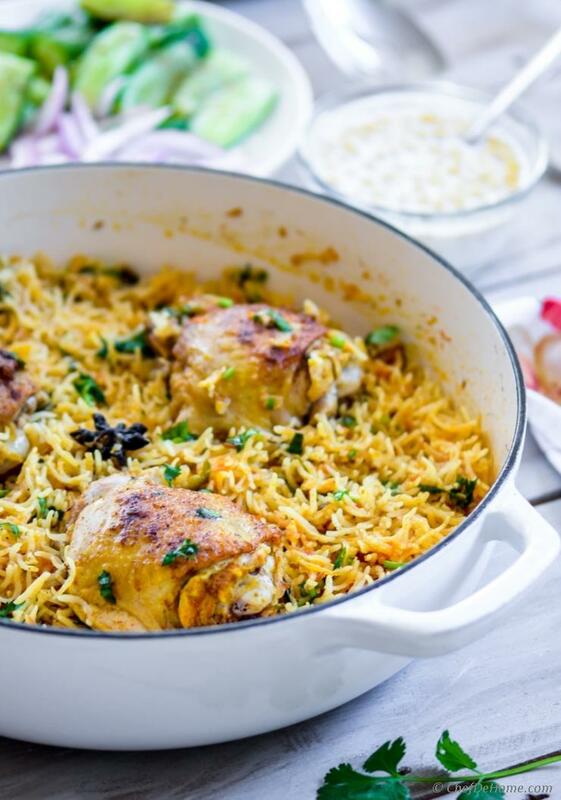 I love chicken thighs and all these flavors of the curry, garlic, and lemon in here. And one pot is always a win! thanks, Rachelle! Glad you like this simple curry, my friend!